In its 6th year, our two churches are serving close to 390 boys and girls with the help of over 150 community coaches, referees and church volunteers. While teaching the game of basketball and cheerleading, the Upward Basketball ministry exists to promote the discovery of Jesus Christ through the game of basketball. This season the children practice time devotions included the virtues of RESPECT, GRATITUDE and TRUST. The Lady & Men Pirate Basketball and ECU Dance teams held a basketball clinic for the Jarvis & St. James Upward Basketball League in Greenville, NC on a Sunday in January in the Taft Christian Life Center of Jarvis Memorial UMC. While teaching the game of basketball and cheerleading, the Upward Basketball ministry exists to promote the discovery of Jesus Christ through the game of basketball. St. James UMC in Greenville, NC continues to host Upward Basketball practices and games for our upper grade divisions as part of the joint Jarvis & St. James UMC league. On any Saturday during the Upward Basketball Season at Jarvis Memorial UMC in Greenville, NC you might unexpectedly see an Elephant or Monkey roaming the Gym and joining in on the activities. With just a one-hour practice on the same night/time slot each week and one-hour game on Saturdays, our Upward Basketball league conveniently fit into busy family schedules. Upward Basketball & Cheerleading Team pictures were taken on a Game Day in February for Teams and their coaches (43 total picture). 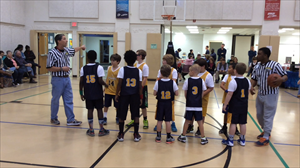 Upward Basketball & Cheerleading opening games for it's 6th season at Jarvis Memorial UMC in Greenville, NC. Live action video of the boys and girls in their Gold and Blue uniforms with their coaches, referees, volunteers, families and friends of Upward Basketball. Fast Break Action video of the boys and girls at St. James UMC in their Gold and Blue uniforms on a Saturday pushing the ball up the court with the coaches, referees, volunteers and families of the Jarvis & St. James UMC Upward Basketball League enjoying the incredible action.